KaroShopping.pk is Asia’s fastest growing online marketplace, offering an unparallel shopping experience in Lahore ,Pakistan. KaroShopping hosts a wide assortment of consumer electronics products also privileges the personalization and security of the shoppers’ experience above all else. Excellent value-for-money, large assortment of original products, fast delivery and easy returns are KaroShopping’s signature. 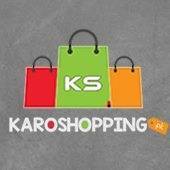 KaroShopping offers a retail solution of optimal convenience. Welcome to Marts.pk. It is the home for online shopping community in Pakistan. It all started with placing some orders online and it worked. Today with Cash on Delivery services online shopping is booming in Pakistan. More and more stores are opening on daily basis including garments, accessories, beauty products, electronics, home decor and much more. You will get the latest information on sales, new products, premier online stores, and complaints of any kind. Don't hesitate to add an online store on the website if it's not listed.